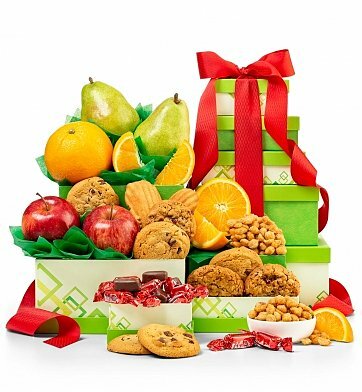 Definitively sweet, savory, crunchy and chewy, this collection of fresh fruit, snacks and candies is a tour of tastes and textures in a tower of five gift boxes designed exclusively by GiftTree. Any occasion will be made all the better by opening one box of delicious fare after another. Juicy Apples, Creamy Pears, Succulent Oranges. French Madeleines, Pomegranate Truffle Cremes. Chocolate Chunk Cookies, Oatmeal Cookies and more. Add Even More Chocolate An extra gift of luxury LINDOR truffles by Lindt can be added to your gift. See the alternate image and select the add-on option during checkout. Weighs 10 oz, holds approximately 14 truffles. Flavors will vary. Each gourmet item is carefully assembled by hand, and the tower is accentuated with a hand-tied satin ribbon. Complimentary scissors are included so your recipient can easily open their gift, as well as a free card with your personal message or greeting. if ordered by 5:00 pm EDT Wednesday April 24th. Fresh from the Orchard Fruit Tower is a hand delivered gift. These gifts are delivered by one of our local design centers located throughout the United States and Canada. Same day delivery is available for most gifts when ordered before the cutoff time. The cutoff time for Fresh from the Orchard Fruit Tower is 2 PM in the recipient's time zone. An orchard-fresh collection of sweet, succulent fruit and treats to share for any special occasion. Orchard-fresh apples, juicy oranges and premium pears. Pomegranate truffles, fresh baked chewy cookies and more. Five exclusively designed gift boxes stacked in a tower. Sent this to my aunt and she was absolutely enjoyed it! We sent baskets for Christmas to three of our kids living far away. Each one of them raved about the contents and the presentation. The baskets arrived exactly on time and contained everything the description stated! We are thrilled to know our family knew we were thinking about them at the holidays and received such wonderful gift baskets. This is the first time I ordered gifts from Gift Tree. Both recipients were quite impressed with the presentation and quality of the gifts. I felt I got more for my money than one of their competitors that I was using for a few years before I discovered Gift Tree. They will now be my "go to" when I need to send out gifts. sending gifts for loved ones that live far away. My sister told me it was very good and tasty. She also said the boxes were nice and the little scissors. I would use Gift Tree again. Presentation, packaging and product were all first-rate! My mom loved it.